This was a Christmas of firsts; my first one as a wife, not a student, the proud owner of a crazy puppy, and I was actually able to contribute to the festivities with food! I mean, I'm sure I could have done that before, but it's easier when you're trying to finish up finals and whatnot. The Saturday before Christmas, Andrew and I went up to Wilkesboro to spend time with my grandparents and my mom's side of the family. It was great to see some family that I hadn't seen since our wedding. We ate some great food, opened presents and just spent some time together. Then on Christmas eve, we did some "last minute shopping" (for Sam) and just relaxed most of the day. We got ready and went to church at 4 for a beautiful Christmas service. For some reason, I was really emotional and could hardly make it through most of it without tears in my eyes. It was amazing how much you could feel the power of God that night. The longer we were there, the more peace I felt wash over me. One great thing about being older, is understanding the true meaning of Christmas and knowing just how powerful that is. After the church, we drove home, gathered the things we needed for his parents house (and Sam) and headed over there. That night was spent watching the kids open up all of their presents and eating some yummy food and just enjoying each others company. Andrew and I also got a few presents as did Sam. After we left, we opened up the presents from each other! That was exciting being able to sit in our apartment and do that (it's the little things). I believe that both of us did an excellent job with our selections. Christmas morning we drove back up to my grandparents and saw more family and ate more food. That was pretty much the trend of this Christmas season--eating. Overall, I would have to say that this was a pretty great Christmas. I loved my first one as a wife and having a husband. But the little changes were hard; not going to my parents on Christmas day and missing out on the little things that I was so used to doing over the years. However, I was okay with the new things that happened this year. I hope everyone had a merry Christmas! I started getting really, really excited yesterday knowing that Christmas was just a mater of hours away. And then I started thinking about how funny it is how when you're little, pretty much from November 1st on is centered around Santa and exactly what presents you were getting. Now, I get excited about funny things like music, smells, food (especially the food) and other little traditions. I love knowing that tonight I will be attending the Christmas eve service with my husband for the first time. Celebrating our first Christmas together is a big deal for me and I'm excited for the ones to come. Another thing that used to not be such a big thing was being with family, whereas now, that is pretty much what our weeks are centered around. For example, tonight after church we'll be going to his parents for food, games and presents and tomorrow morning we'll go to my grandma's for a little bit. I love knowing that we have the opportunities to spend quality time with our families and enjoying their company during this wonderful season! AND another great part about this Christmas is celebrating with our puppy who was getting a little impatient with me last night as I tried to get her picture. Here is one example: She is still so wonderful! Hope everyone has a very merry Christmas eve!!!! Describes my life these past few weeks. Between work, Christmas shopping and traveling, I am ready to sleep for about a week straight! Two weekends ago, Andrew and I went to Boone for the App playoff game, and needless to say, the outcome was not what we had hoped. But despite that, we had a great time seeing friends and going to Cornerstone Summit that Sunday morning (by far the best part). It made me realize just how much that church and town influenced both mine and Andrew's lives. 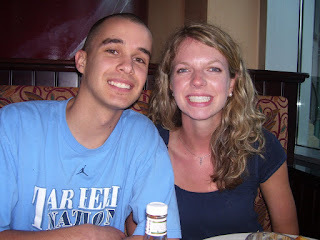 Then, not even a week later, Andrew and I left to visit the Briley's up in Baltimore. It was so great to go up there and see where they've lived and what they've been a part of for the past year. Andrew and I left Friday morning at 5a.m. 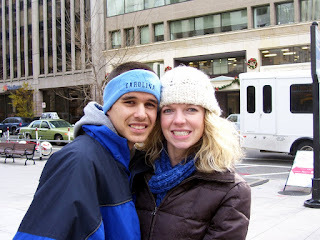 and met Steffi and (her) Andrew in a town that's between Washington D.C. and Baltimore. From there we took the metro (i love saying that) to D.C. for the afternoon. Fresh off the metro and into the cold! 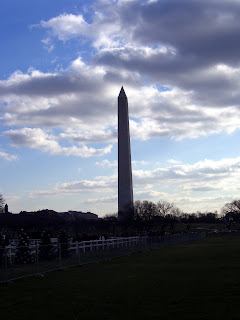 We were in D.C. long enough to do a little sight-seeing and go to the Holocaust Museum and one of the Smithsonian's. 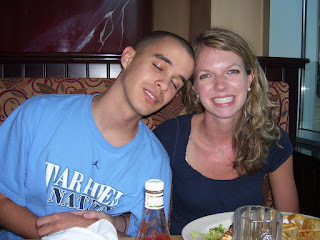 After that, we hopped back on the metro, got our cars and went to dinner at Cheesecake Factory (my favorite!). And that pretty much sums up Friday because after all was said and done, we were all exhausted! Saturday was spent eating yummy food, walking around the Harbor and finding pretty much the most interesting and amusing place in Baltimore to watch the Carolina basketball game. Two greats under one roof! 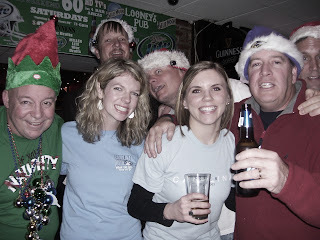 At Looney's for the game/best Santa's EVER! Another great point of Saturday night is that Steffi and Andrew (B) were on the news! A cameraman was asking people to give their input for the Baltimore/Pittsburgh game (worst calls EVER) and they chose the the Briley's to be one of the people they showed during the 11 o'clock news! It was hilarious and made for the best ending of the night! Sunday, we went to church, and afterward went to the ESPNZone to watch the Raven's game and let me tell you, people up there are intense about their team. We left around halftime and finished watching at in the safety of the Briley home. Once the game was over, Steffi and I went and got ice cream and Wall-E from the Blockbuster. It was such a good movie! I highly reccomend it. Monday (the sad last day) we were able to visit Hopkins and see where Steffi spends the majority of her life. After our short tour (Steffi is a great guide) we went to Fells Pointe, which is a super cute area on the water with a ton of great stores. We (the girls) probably could've spent hours walking and shopping, but we decided to spare the boys. But it was a beautiful place! We ate dinner at this amazing restaurant called "Mama's on the Half Shell"--gotta love the name--and we all probably weighed 5lbs more after we left. The food was incredible! And unfortunately, that pretty much is all there is to tell. 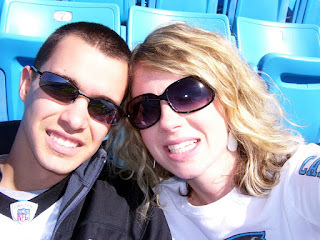 Andrew and I drove back to Charlotte Tuesday and the real world started back. 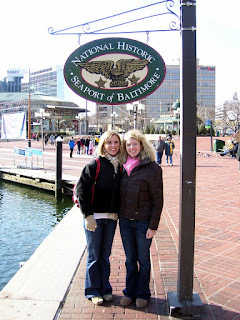 Baltimore was amazing though and I loved being able to see 2 of my best friends for four uninterupted days! And I can't wait to do it again! Hope everyone is getting pumped for the days ahead! Yummy food and good times with family and friends! P.S. 8 more days till Christmas!!! So I'm in Boone...and i forgot my camera. That is my age. I remember when that sounded so old and I know I realize exactly how much of a baby I am. Yes, I'm married and have a full time job, BUT I still have so much to learn and so many areas yet to grow. And I am embracing those things. 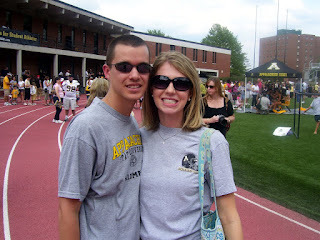 God has taught me not to rush through life because now, I am looking back at my college years, the months before the wedding and even my wedding day...and I miss it all so much. As easy as it is to say "every day is a gift" why is it so hard to treat it that way? God gives us each and everyday to make a difference, to glorify HIS name. And I know that may seem simple and possibly cheesy, but have you taken time today to realize the grace He poured over you so that you may wake up and start a brand new day? Blessings come in every way, and hearing your alarm clock this morning (even if it's at 6am) is a blessing. Okay, so let me tell you about the blessings I had yesterday. Andrew and I both took yesterday off so that we could spend it together and that in itself was great. I opened my presents first thing yesterday morning (because I am 5 years old) and discovered the 4th season of Grey's Anatomy, the new Nicholas Sparks book, and a gift card to American Eagle (yay!). I was so excited about all of it. Presents were followed by Andrew making me pancakes for breakfast and then going to a pumpkin patch to pick out our pumpkin of the year. We of course had to take Sam with us! After pumpkin picking, we got some lunch and just relaxed for the rest of afternoon. Dinner was the BEST because we had Cheesecake Factory (and if you've never had it, I HIGHLY recommend it). The food was great and our service was AMAZING which always makes everything a little better. Yay for birthday sundaes! Once we got home, we carved our pumpkin and then spent the rest of the evening watching Halloween episodes of shows. It was perfect! 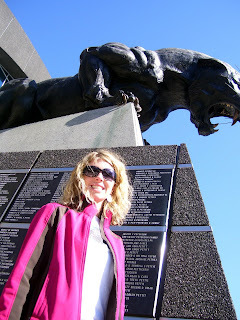 I have FINALLY gone to a Panthers football game, and let me tell you, it was so much fun! Andrew was able to get tickets earlier in the week and I was pumped because it was for the Saints game which was definitely the one I wanted to make it to (I have a thing for Reggie Bush). 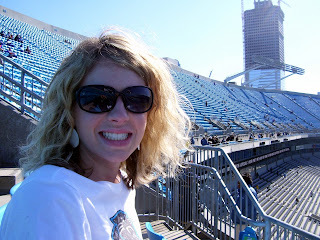 We were able to get there with enough time to walk around and see just what Bank of America Stadium is all about. Once we got into the stadium (and away from the creepy guy) we went to the Fan Store and looked at all the overpriced stuff before grabbing some lunch and making it to our seats. Once the game started, it was pretty obvious who was going to win, so we were able to sit back, relax and enjoy. We actually ended up seeing two of our friends from school and we were able to sit with them for a little bit which made the whole afternoon a little better. After the game, we went back to Andrews parent's house and ate dinner. 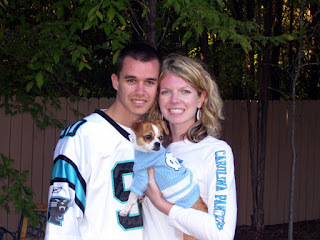 It was a chilly day and we had put Sam's UNC sweater on her and of course I had to get some "family"pictures! Christmas card potential?? I think so! Day to day life has not really changed these past couple of weeks, which is fine by me! Having a rhythm has its pros and cons. I like knowing more or less what will happen everyday, but at the same time, it can get kinda boring. Yesterday, I went to Sheila Stover's baby shower which was a lot of fun and had a lot of good food. 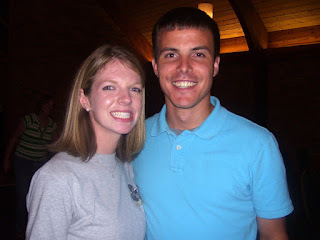 Sheila is super cute pregnant (I know you read this mrs. stover, but i'd still say it!). After that, Andrew and I had to take care of getting me a new battery for my car because mine died on Friday afternoon. Thankfully, that has been the most eventful experience I have had lately. We got home in time for the UNC/ Notre Dame game, which let me tell you, was great to see because that is the first time in 46 years that Carolina has beaten the Irish. The night was topped off with pizza and "Baby Mama", which was cute, but not as funny as I had hoped. Andrew had to go to work at about 4am this morning (Sunday) so I pretty much had the day to myself. After church, I took care of some things around here and then had lunch with Alisha which was so nice! It has been too long since we've had time to hang out. Once my hubby got home, we ate dinner and did some grocery shopping. I'm excited that for once he doesn't have to leave for work tonight. It'll be a relaxing night. Hope everyone has a great monday! Today, one of the most influential women of my life celebrates another wonderful year of being on this earth. I am super sad that I can't see her today or even this weeknd, but I will be going home in a couple of weeks, so that makes it a little more okay. I am so blessed to have a mother like her. She is amazing and supportive in every possible of way. My life wouldn't be complete if she wasn't in it. Andrew and I have decided to start meeting with Tom and Sharon Burger about twice a month for accountability purposes and just to have a couple in our life that can help us and just talk to us. On Tuesday Andrew and I went over to their house for dinner around 6:15. It was amazing; stuffed chicken, salad, bread, rice and good conversation. It was so nice and relaxing and just to see God's love work through them is great. It's going to be an awesome experience. These next couple of weekends are going to be super busy but so fun! This Saturday I have to work and we have Colleen's wedding to go to and next week I am going to a baby shower and then Andrew and I are going to the Bank of America 500. Yes, I'm going to a NASCAR race. Crazy. But I believe it will be a lot of fun. Have a mentioned that I love fall? Prepare yourself for possibly the deepest, most though-provoking statement EVER...are you ready? Life is FULL of changes and ups and downs. See, you're amazed aren't you? Yeah I thought so. These past couple of weeks have definitely felt that way for me. I'm slowly learning that marriage is not something that can be figured out in 3 months (can you believe that?). But anyways, Andrew and I are trying to figure out different things that we can both do and work on to insure our sanity. The past few days were kind of rough for various reasons that I will not bore you with. But finally last night, we sat down and talked out some things that have just been held silent. It was great and extremely freeing. I am blessed to have a husband who is willing to admit when he's messed up or acknowledge when something needs to change with him or me or both. All in all, last night made up for the past few weeks 10 times over. On another note, the Bible study that I (we, whenever Andrew can make it) has been so great and such an amazing learning experience. God is using the Burger family in a remarkable way and I am so excited to be a part of it. I'm excited for this weekend for a couple of reasons; 1) the weekends are always nice 2) tonight Andrew and I are going to dinner and watching Made of Honor (yay!) 3) I get to go to Winston and get my hair done and get to spend time with my parents. and 4) Church on Sunday is always worth looking forward to. And on top of all of that the temperatures are falling and the crispness is starting to creep into the air. Loving life and taking it all in...one day at a time. That's it. I love them. It's nice to know that for 2 days, I can more or less do what I please. Tonight Andrew and I are cooking seafood (and when i say Andrew and I, i really just mean him) and watching a "The Prestige". I am excited to see the movie for two reasons; 1) it looks really good and 2) Christian Bale is one good looking guy. It will be nice that tonight, Andrew and I can relax after a long week of work...although he still has to work this weekend. So I guess it's not AS nice for him. Speaking of work, even though I have really been enjoying my job, today was definitely a not so great day. I'm still learning and getting into the swing of things and today was just not the day to be at that level. Overall, it was a pretty steady, not so crazy day. But sometime after lunch, EVERYTHING arose. I think of myself as a pretty good multi-tasker, but today I may as well have been the worst. 14,003,975 things were going on at the same time and I was pretty sure my head was going to implode. Thankfully, it didn't and things finally calmed down. Everything got done that needed to get done (more or less) and I was even able to leave early. But right before I did, the two girls that I work with stood around and talked for a few minutes and that was by far the best part of my work day. So even though it had it's rough parts, today was actually a pretty good day. And now I'm ready for my seafood dinner that my amazing husband is fixing at this very moment! Fall & football are here! After months of hot summer days, it is finally time for the temperature to start falling and for excitement in the sports world to once again arise. I love this time of year. The weather tends to be more or less perfect! Andrew and I recently bought a "grow it yourself" pumpkin kit (yes, we know we're nerds) and they have actually started growing. We'll have to see if anything actually comes from it...like a pumpkin. But, it's still fun to see it's progress. I have finally settled into the routine of getting up early and going to work all day, and I'm really starting to enjoy it. I love the people that I work with and that definitely helps the day. It's hard though to get everything in during the day that I need to. I supposed that's how it will just be though. On another note, Andrew and I have started going to a Bible study that the Burger family is leading. Well, me all the time, and Andrew whenever he doesn't have to work. It has been such a blessing. I have known I've needed a something like this, but I just wasn't sure where it would come from. And here it is, my answered prayer. There is really nothing to report other than that! Life is great and I love having an amazing husband...and a pretty great puppy! I am so sorry it's taken so long to write a new post!! These past couple of weeks have been slightly hectic, but in a good way. I just finished my first week of work so that was a huge plus. It definitely will not be a hard job, which is good and bad. Good that it more than likely will not stress me out; bad that I will probably become bored after a couple of months. So we will just have to see. But I really like the people I work with. The other front desk girls are really sweet and most of the nurses are nice too. An overall very positive atmosphere. On Saturday before the App/LSU game, I went and bought my first few sets of scrubs (yay!). I can't wait to wear some this week. And I just finished ordering some Grey's Anatomy scrubs (it is an actual brand) and those will be great becasue they are super soft. Okay, enough about my scrubs. It was nice to have a long weekend and be able to actually look forward to a weekend. Saturday, I watched football pretty much all day and just relaxed which was fun and very needed. I hated to watch App not do so hot in Baton Rouge, but it is always a fun thing to see them competing against such a well known football team. Church yesterday was AMAZING and I needed to hear that message so much. It's so funny how God can just remind you of His love and grace at the times you need it the most and may not even realize it. I also got to see some family friends that I haven't really seen in YEARS! They were at my wedding, but I didn't really get much of a chance to talk to them, so last night was great. Today, Andrew and I both had the day off and we were able to spend it together and with some of our great friends. 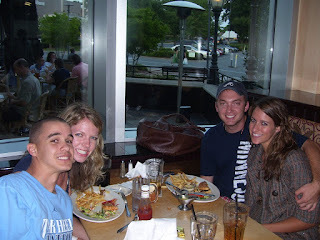 We met up with with Jen, Derrick, Chris, Kristin, Hollie, Joel, and a few others at TGI Fridays. During lunch, some of the guys thought that it would be a good idea to tell the waitress that Derrick's birthday was today and if today was in February, then maybe. But thankfully they do not check id's and so we all got to split a huge bowl of ice cream. I'm all for free dessert. After lunch, we proceeded to walk around Concord Mills for what felt like a lifetime. It was nice though just to spend some more time with people we don't get to see that often. We finally left to drive back home around 4:15. Once we got here, Andrew went to the store and got the makings for lasagna. It was soooo good. I had been craving it ever since I had seen it on Run's House. But, it's back to the working world tomorrow morning bright and early! I hope everyone had an amazing Labor Day weekend! This is going to sound weird. And you may even think I'm crazy for saying this. But oh well...I love fighting with Andrew. See, I told you, crazy. I mean, I don't like actually fighting, but I enjoy the fact that we can talk about things that frustrate us, make us mad, etc. Last night had our first "fight". For about 30 minutes we sat there and told each other what was frustrating us and making us mad and afterwards there was a HUGE difference even in how we talked to each other. It has always been hard for me to really say what was bothering me, but Andrew won't let me not talk. And thank goodness for that! On another note, something that Andrew and I have started doing after dinner, is sitting down and reading the Bible together. Right now we are reading Acts and I have loved sitting and listening to Andrew read out loud and us discussing what we liked, what we think is the most important and the overall theme or purpose of verses/chapters. It has been a great way for us to spend quality time together as well as in the Word. OK, that's the last of the seriousness. Yesterday we went and saw The Dark Knight and I am going to say what almost everyone else has said...it is AMAZING! I normally dislike long movies (and 2.5 hours is long) but once it was over, I was ready for more. I hope they come out with a 3rd one. So other than me having a phone interview sometime this week with a marketing company here in Charlotte, that is all I have to report! Life is great. One thing to leave you with is this: This would be Sam waiting patiently for a piece of popcorn from Andrew last night. Bless it. Have you ever noticed that there is always a destination in your mind? You are always counting down the days until "blank". Well, stop. Stop waiting and wishing for that "blank" to be here. The whole time Andrew and I were dating, I couldn't wait to be engaged. 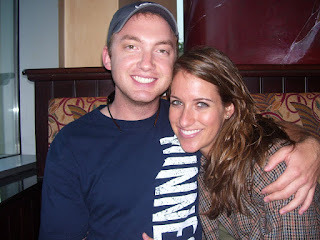 Once we were engaged, I couldn't wait to be married. And now I'm wishing I could have my wedding day back. Not to say that I don't love being married, because I do. But what about the right now. Right now I am married to a wonderful man; right now I have the sweetest puppy; right now I live in a wonderful (somewhat furnished) apartment; right now God is teaching Andrew and I how to be a husband and wife. God has brought Andrew and I to this place together. For 2 decades we were growing up by ourselves, and now it's time to grow up together. I am excited for the right now. I have no idea what all the future holds, but I do know that today I am happy, blessed and healthy. Enjoy what you have RIGHT NOW because you have no idea what can happen tomorrow or the day after that. Take a moment to tell your friends and your family that you love them. Take sometime to remember all that God has done and has yet to do. The time we have on this earth is brief. Sit back, enjoy the ride, and know that God is in control. I saw the Lord always before me. This past weekend has been amazing! It was spent with my wonderful husband, some great friends and just having fun. It started Friday evening which consisted of turkey burgers and shells & cheese for dinner. Let me tell you, that is the best meal ever...well maybe not EVER, but it was very good. After dinner, Andrew and I went and played tennis and got ice cream after that. We went to Stonecrest Shopping center to get the ice cream and stuck around for a few minutes and watched a band that was playing. All of those things combined made for a pretty spectacular Friday night. 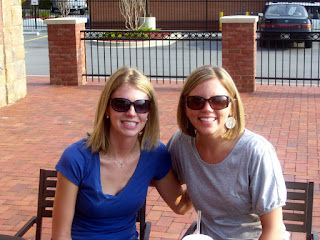 Saturday afternoon was spent with 2 of the greatest girls I know--Alisha Burger and Becky Fain. We spent about 2 hours walking around South Park Mall and marveling at the fact that rich people will spend upwards of $600 for a pair of shoes, $11,000 for a coat and (get this) $250 for a pair of sweatpants...any piece of clothing that has the word sweat in it should not have 3 numbers before the decimal. I mean, it is a completely different world they're living in. Needless to say, we did not buy anything but ice cream. Which was totally worth the $4 that it was! 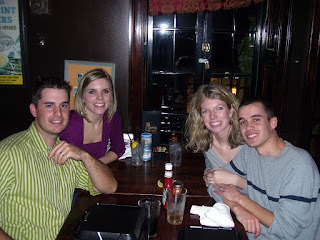 That night, Andrew and I went out on our first double date as a married couple. We went with Alisha and her boyfriend, James, to the Cheesecake Factory and after waiting for almost a hour, we all enjoyed some amazing food and great conversation. We (meaning Alisha and I) of course had to document the night and asked our waitress, Ida, to take a group picture. 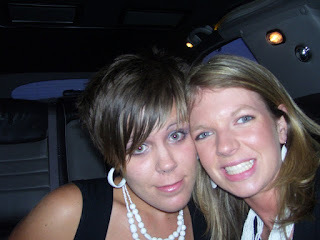 Yes, we were those people. And finally, after a couple of tries we got a good one! 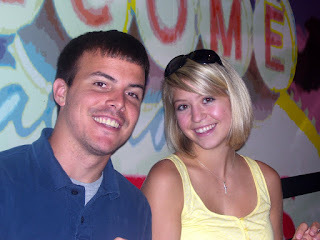 The WONDERFUL couple that we double-dated with! After dinner, we all went to the house that Alisha is house-sitting and ate our cheesecake and watched the movie, "Vantage Point" which I definitely recommend. All in all, I would also say that Saturday was almost as spectacular as Friday! Sunday (equally as spectacular) was spent going to church, working out and eating a great meal with Andrew and his parents. God has truly blessed both of us with great friends and great families...AND a great past weekend!